Journalist estimates put the number of people taking part in the nationwide protest at around 3,000. 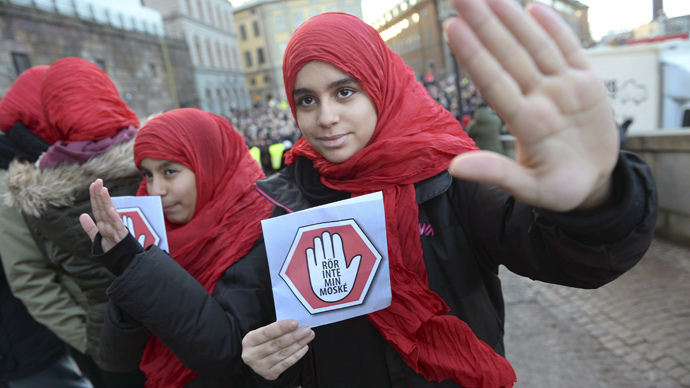 In Stockholm, some 2,000 activists gathered in front of the Royal Palace with placards slamming growing Islamophobia. "I came here because I am against the mosque attacks,” anti-racism campaigner Yasin Ahmed told The Local. ”They are not only attacks on mosques but also against Swedish democracy. I am a Swedish citizen first and I am also a Swedish Muslim seeking to protect my rights and to show solidarity with others to deal with this Islamophobia". Some 40 groups organized the protests, including Sweden's Muslim Council and the Swedish United Nations Association. Prominent people from the Muslim community addressed the rally, which also drew some high-profile officials including Alice Bah Kuhnke, minister of Culture and Democracy. Similar rallies took place in Gothenburg and Malmö, but on a lesser scale - 500-600 people at each location, according to Anadolu News Agency. The government condemned the attacks and promised to increase funds to provide security of worship places. "In Sweden no one should have to be afraid when they practice their religion," Sweden's Prime Minister Stefan Lofven told the TT news agency. On December 25, five people suffered injuries when a petrol bomb was tossed through the window of a mosque in Eskilstuna, to the east of Stockholm. Up to 20 people, including children, were in the mosque at the time of the attack, which occurred in a residential area. On Monday, an attack took place in the southern Swedish town of Eslov, just after 3 am local time. No one was injured on that occasion. In autumn, the same mosque was vandalized, local newspaper Expressen reported. Over the past year, there have been at least a dozen attacks on mosques nationwide, says Swedish anti-racism magazine Expo. The attacks followed the debates concerning immigration in Sweden. Far-right party Sweden Democrats got strong support in September elections calling for decreasing the number of immigrants, however, it did not enter the ruling coalition.